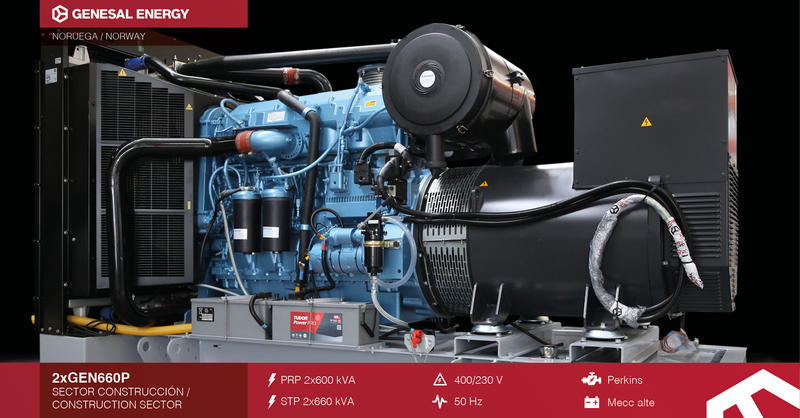 We’ve supplied two 660 kVA gensets through our distributors in Norway, prepared to operate in parallel, which will guarantee the electricity supply of a fish farm. Supply power in the event of a mains failure to guarantee the operation of the electrical and water supply systems necessary for the breeding of fish, such as incubators, water circulation and transfer systems or automated machines for the feeding of the fish, amongst others. The engine has been painted with a special anti-corrosion treatment and the alternator contains anti-condensation heaters in its windings, to protect the gensets from the high levels of concentration of salt in their surroundings. Both gensets are going to work in parallel, guaranteeing necessary power supply in the event of a mains failure.